Toronto being the metropolis that it is, there are many answers to the question of the best way to get to Rogers Centre for a Blue Jays game (or a concert or Argonauts game, for that matter). You can drive or use the many TTC options. 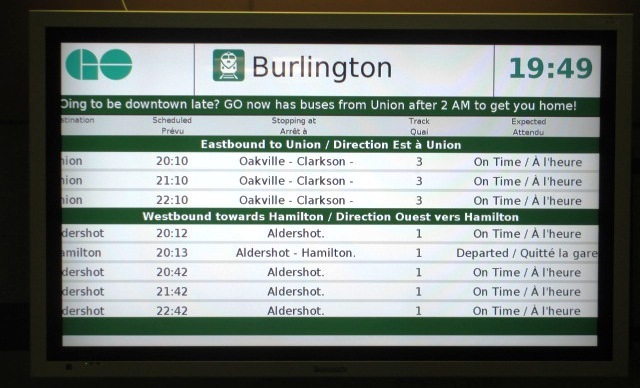 But unless you’re living or staying within a couple of miles of the ballpark, I highly recommend using GO Transit. Like most train lines, they feature a helpful schedule. 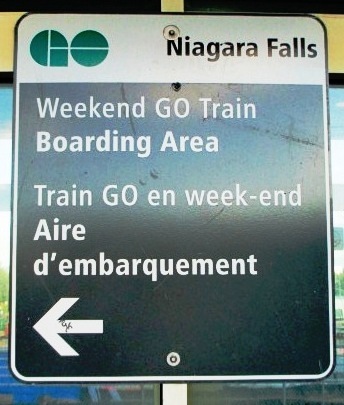 GO stands for Government of Ontario; the transit system originally began as a suburban rail line along the shore of Lake Ontario, and has since been extended to serve most of the southern half of the province. There are currently seven rail lines reaching as far as Niagara Falls—so one can technically enjoy the Falls and a ballgame in the same day, if you’d like to throw a romantic bone to your non-baseball fan significant other (or leave him/her there while you get on with more serious business). Apparently there is a different boarding area for weekday trains. GO is good for any baseball fans living near the rail lines. All of the routes lead to Union Station in downtown, which is a short walk through an indoor skywalk to Rogers Centre. The train ride is smooth, reasonably fast (although not as fast, say, driving on the Q.E.W. during those rare non-peak times), and while it’s not the cheapest form of travel, it’s still probably better for 1-3 people than using the gas to drive to a game and pay the hefty Rogers Centre parking fee. Lots of Jays fans use GO to get to the ballpark. Despite the capacity of the multi-level trains, they can reach standing room crowd level especially after a high attendance matchup. These fans already know the best way to get to Rogers Centre. This makes things nice and easy for the Toronto neophyte, who can follow the blue shirts through the Skywalk to Rogers, but you should stand on the ends of the platform, where there are fewer people trying to get a seat. If you don’t get a seat, you shouldn’t have to wait too many stops before enough people get off. The only real complaint about GO that Jays fans have is the infrequency of service. On weekends, which is when the most fans show up for games, the trains only run once an hour and there isn’t any additional Jays game service. 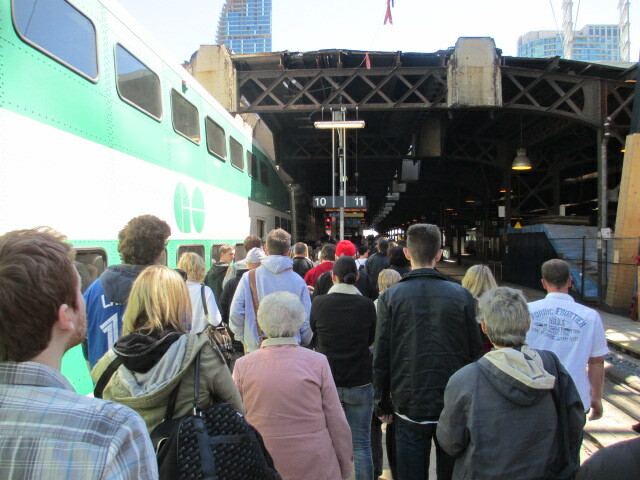 You might want to take a ride up to the top of the CN Tower or take a walk downtown while everyone files out on the first train. Mastering the ticket machine is always the tricky part of public transit. It’s also a little pricey…it’s probably about the same as what you’d be paying for gas if you took your car, if by some miracle you could find a free spot. But that’s assuming no traffic, which is an assumption you should never make in Toronto. But for the best way to get to Rogers Centre from the suburbs, GO is probably the ideal option for fans. Want to know more about Rogers Centre? 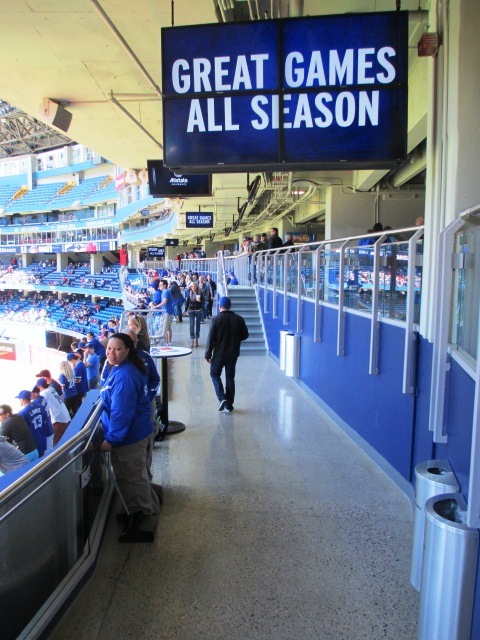 Sign up here for my completely free Rogers Centre e-mail newsletter series, and score some seriously valuable info about tickets, seating, transportation and food…see you at the Yard! Enjoying the cool Blue Jays game tips? Sign up today for the absolutely free Ballpark E-Guides Rogers Centre newsletter!